Three years after their launch, VXX has about four times as many assets as its mid-term sibling, VXZ. When it comes to public relations and media column inches, I imagine the ratio is more like 50-1 in the favor of VXX. In many ways VXZ is the unloved stepchild of the duo. I recently opined that when it comes to the inverse variants of these two ETPs, ZIV is Undeservedly Neglected. I believe the same case holds for VXZ. One of the great difficulties in trading VIX-based ETPs is that while the potential returns are enormous, when things move in the wrong direction, a bad trade can spiral out of control and trigger an extremely painful loss with surprising speed. This is a large part of what makes VXZ more attractive than VXX. Even though VXZ is relatively volatile, with a current 30-day historical volatility of 39.5, it pales in comparison to the 70.1 30-day HV of its rocket-fueled short-term brother, VXX. In this case, the slower the train wreck, the more easily it can be avoided and position risk becomes much more manageable. In addition to the lower volatility, VXZ is also much less susceptible to the contango and roll yield issues that plague VXX. In fact, on average VXZ is only subjected to about 1/3 of the negative roll yield that impacts VXX, which is a large part of the reason why the long-term performance of VXZ is much superior to the numbers put up by VXX. 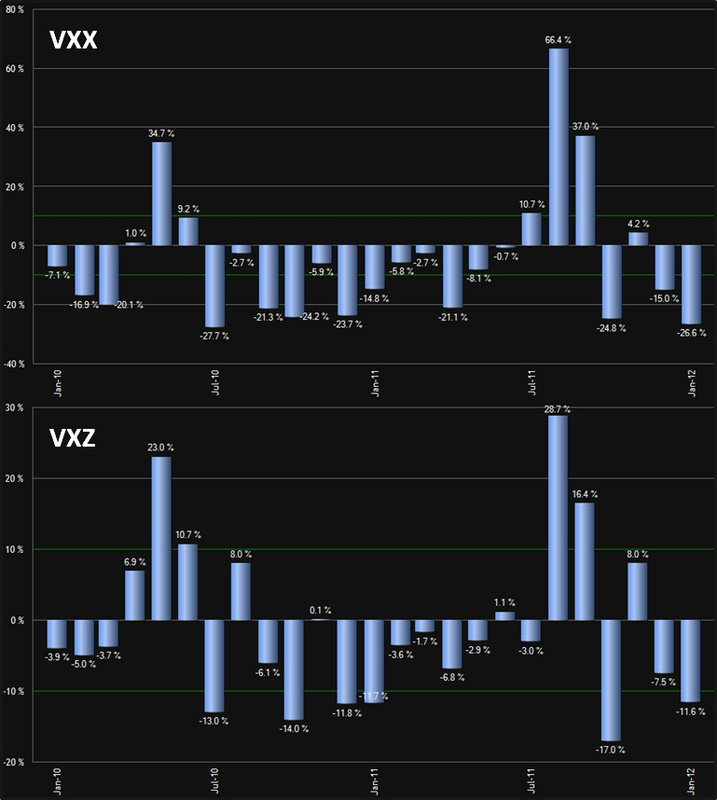 To illustrate this point, the chart below shows the month-by-month performance data for VXX and VXZ going back two years. In summary, if you are impatient and you like action, VXX is the better bet, but if you have some patience and want better odds, VXZ is often a better long volatility play.